The Dry Bag – A Perfect Piece of Kit to Keep Your Stuff Dry While Hiking! The dry bag helps solve a simple but pertinent problem every hiker faces at some point on their hiking adventures. That problem is how to keep some of your important bits and bobs bone dry in even the wettest hiking conditions. Sometimes, no matter how good a pack you have or no matter what waterproof covers you have, if the weather is nasty enough, rain will sometimes still seep through into your pack and start to get the contents wet. For many items that you carry in your day pack, this really isn’t a big deal. It’s OK if your water bottles or hydration bladder gets a bit wet. You probably don’t mind if your airtight lunch box gets some rain on it as long as the your food contents inside remain dry and edible. When it come’s to these things, you can’t risk water exposure! A category a., from above, example of this would be your smart phone which will likely have some working issues if water gets in at it. You can use zip loc bags to try and help with this, a simple and easily implemented solution. A category b. example might be if you have some spare hiking clothes packed away neatly in your pack but water get’s in at them in a downpour. So, how can the hiker best solve this eternal problem and be certain to keep their essentials dry while out on the trail? The answer is the ‘Roll Top Dry Bag‘. 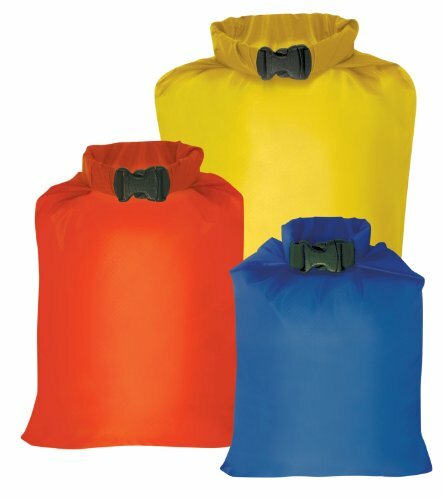 What is a Roll Top Dry Bag? Roll Top Dry Bag’s are simple but neat, and you could argue crucial, little things you should have as a part of your hiking kit. They work very simply, are lightweight and practical. I have taken some photo’s of one of my roll top dry bags to help illustrate how they work. In the photo above you can see the empty dry bag laid out in full (The bag pictured is a 5 liter bag). The bag itself is made from lightweight siliconized fabric which is both waterproof and wear resistant. High quality taped seams seal the pack air tight at it’s edges. All in all, great at keeping wet and rain out! At the top, to the right of the picture, notice the two clips on either side. These are a click-shut buckle when joined together. There’s a band, black and about 1.5 cm’s wide, along the top which run’s from one part of the buckle to the other, the whole way round the top of the bag. This enables a roll top function for additional air tight sealing. After you’ve popped your bit’s into the bag, simply use the roll top band to roll the bag closed. This ensures extra sealing on the top of bag preventing water, and even air, from getting in (Note, you need to roll the bag at least three times to ensure full sealing). When you get the bag rolled up as much as necessary, simply clip the two clips together and there you have it. A fully waterproof and air tight bag! The clip buckle can also be used to hang the bag up easily if required. There are of course many different sizes available from small 2 liter bags right up to 100 liter bags so you should be able to find something to suit your needs. Roll top dry bags are a great addition to your hiking kit and, as I know from experience, they do work. They’re great for popping your key’s, wallet and phone into for a day hike and they also can be utilized for all manner of other activities like camping, fishing, hunting or any other outdoor sports where you need to be 100% sure of keeping your stuff dry. For convenience, I’ve pasted below a decent set of roll top dry bag from Outdoor Research. Worth a look if you are in the market for some. I hope you found this post on Dry Bags informative and useful. If you need to keep any kind of gear dry while out on the trail or in the wilderness in general, these really are a good option. If you’re on a budget, you can utilize things like Zip-loc bags for your phone (if you need to use it while hiking) and tough bin liners can also work well. However, when you can, I recommend investing in a few Dry Bags, they’re handy to have and work a treat. I am a fan of them for sure! I use them for day hiking but I also find them really excellent for camping trips. Hi Wilfred, yes, they’re really handy things to have for keeping stuff try. I’ve used them in torrential downpours and they’ve done the trick and kept everything dry, really great! Dry sacks or bags as you say are essential when traveling for a few days or more. Nothing worse than opening your bag to find your gear is soaked from that last heavy down pour. I even use them when on fishing trips that cover a few days. I have dropped gear in the water before and been left in a fix. Not any more even if dropped in the river the gear inside stays bone dry. Yes, I think dry sacks / bags are indispensable. I use them for day hikes as well as longer treks but they’re so handy for so many other activities. I have had the experience of having my gear soaked and you’re right, there is nothing worse! Fishing is a fantastic example of another great use for them and how resilient they are, even when dropped in a river!